Arianespace has successfully launched two telecommunications satellites: ViaSat-2 for ViaSat Inc.; and EUTELSAT 172B for the operator Eutelsat – which is the first all-electric satellite to be orbited by an Ariane 5. The launch took place on Thursday, June 1 at 8:45 pm (local time) from the Guiana Space Center (CSG), Europe’s Spaceport in Kourou, French Guiana. Today’s launch was the sixth of the year for Arianespace, and the third in 2017 with the Ariane 5 heavy launcher, which recorded its 79th successful mission in a row. The Ariane 5 ECA also set a new performance record into geostationary transfer orbit, carrying a total payload of 10,865 kg. (of which 9,969 kg. was the net liftoff mass for the two satellites). With this mission – the 289th by its family of launchers – Arianespace is at the service of connectivity on a global scale. Arianespace at the service of ViaSat Inc.
ViaSat-2 is the second ViaSat Inc. satellite to be launched by Arianespace, after WildBlue-1 in 2006. ViaSat, a global broadband services and technology company, aims to change the general perception of satellite internet, globally. The company has set out to advance global connectivity and solve one of the hardest communications problems: making the internet accessible and affordable to all. The ViaSat-2 satellite system will bring considerable improvements in terms of speed, lower costs and extended broadband coverage. Its coverage zone includes North and Central America, plus the Caribbean, northern South America, and aeronautical and maritime routes in the Atlantic Ocean between North America and Europe. ViaSat has also chosen Arianespace to launch a ViaSat-3 class satellite, further extending the partnership between the two companies. ViaSat-2 was built by Boeing in El Segundo, California, using the 702HP platform. 54th Boeing satellite launched by Arianespace since orbiting Aussat K3 in 1987. 4th satellite based on the 702HP platform to be launched by Arianespace. 3 other Boeing satellites in the Arianespace order book for future launches. EUTELSAT 172B is the 32nd satellite launched by Arianespace for Eutelsat, starting with EUTELSAT-1 F1 in 1983. Eutelsat is one of the world’s leading telecom satellite operators, with a fleet of 39 satellites serving a broad range of customers. Including today’s mission, Arianespace has now orbited more than half of all Eutelsat satellites. EUTELSAT 172B will increase the operator’s capacity for fast-growing applications, such as in-flight and at-sea connectivity, mobile network interconnections, video and government services. It will be positioned at 172° East – a strategic orbital position providing exceptional coverage of Asia-Pacific, on land and at sea, from Alaska to Australia. Two more Eutelsat satellites are in Arianespace’s order book. EUTELSAT 172B is the first all-electric telecommunications satellite to be built in Europe by Airbus, in Toulouse, France, and uses the new all-electric Eurostar E3000 EOR (Electric Orbit Raising) platform. It is also the first all-electric satellite to be launched by Arianespace on an Ariane 5. Airbus’ development of all-electric Eurostar satellites was supported by ESA and European national space agencies, especially CNES in France, in the framework of the PIA program (Program for Investments in the Future). EUTELSAT 172B is the 118th Airbus satellite launched by Arianespace. The Arianespace order book includes 15 Airbus satellites to be launched. 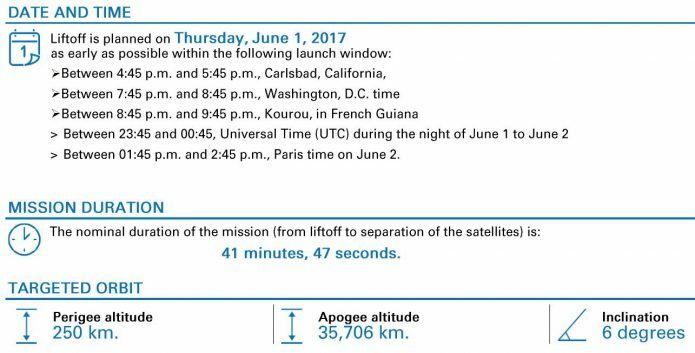 The payload for Flight VA237 set a new record for the mass carried into geostationary transfer orbit, totaling 10,865 kg. (9,969 kg. net for the satellites). With this performance, Ariane 5 beats its previous record of 10,737 kg. (9,856 kg. for the satellites), set on August 24, 2016 during Flight VA232. This launch brings the total performance gain achieved since the beginning of Ariane 5 ECA operations to more than 1.5 metric tons. This performance will continue to gradually increase during the coming years. With six launches, all successful, between January 27 and June 1 (three by Ariane 5, two by Soyuz and one by Vega), Arianespace maintains a sustained pace of operations. To date this year, Arianespace has already orbited eight geostationary satellites, totaling 34.57 metric tons, and one Earth observation satellite. The three successful launches in less than a month – two by Ariane 5 (May 4 and June 1) and one by Soyuz (May 18) – clearly show the operational maturity of Arianespace’s family of launchers. The next Ariane 5 launch, planned for June 28, will bring the total number of launches in the first half of 2017 to seven. Three more Ariane 5 missions and two with Vega are planned during the second half of the year. The in-flight connectivity market, boosted by strong development momentum, is expected to grow by 300% in the next 10 years, with the number of Internet-enabled aircraft increasing from 5,300 in 2015 to more than 26,500 in 2025. Arianespace clearly supports these new space-based applications designed to improve people’s lives, with six geostationary satellites dedicated to in-flight connectivity in its order book for future launches, plus the OneWeb low-Earth orbit constellation. Shortly after the announcement of the orbital injection of the two satellites on today’s Flight VA237, Arianespace Chief Executive Officer Stéphane Israël said: “With this third successful Ariane 5 launch of the year, and the 79th consecutive success in a row, Arianespace proudly delivers its service excellence to our American and European customers in support of global connectivity. The new all-time payload weight record set by this launch, which also was the first orbiting of an all-electric satellite by our heavy launcher, confirms the power and flexibility of Ariane 5. “We are very honored by the confidence shown by ViaSat Inc., which has chosen Arianespace for the second time, as well as that of the European operator Eutelsat, for whom we have launched 32 satellites since 1983. Our congratulations to Boeing, which built ViaSat-2, and to Airbus, which built EUTELSAT 172B – the first satellite to use Europe’s all-electric Eurostar E3000 EOR platform. ViaSat-2 was built by Boeing in El Segundo, California, using the 702HP platform. Positioned at 70° West, it will provide about 300 Gbps of throughput in Ka-band for North and Central America and the Caribbean, northern South America, and the aeronautical and maritime routes in the Atlantic Ocean between North America and Europe. It weighed 6,418 kg. at liftoff and offers a design life exceeding 14 years. EUTELSAT 172B was built by Airbus in Toulouse, France, using the new all-electric Eurostar E3000 EOR platform. Positioned at 172° East, EUTELSAT 172B will provide fixed and mobile services, as well as in-flight connectivity for the Asia-Pacific region. It weighed 3,551 kg. at liftoff and offers a design life exceeding 15 years.